Lonnie Wheatley, QUEEN CREEK, Ariz. (April 8, 2017) – Brian Brown had an Arizona sweep within sight. But Rico Abreu was having none of it. Abreu chased Brown down in traffic midway through Saturday night’s 30-lap Arizona Desert Shootout and then kept David Gravel at bay over the closing rounds to capture his first World of Outlaws Craftsman Sprint Car series win of the season atop the 1/3-mile Arizona Speedway clay oval. After a critical pass of defending race winner Shane Stewart in heat race action to land a Dash position, Abreu landed the front row outside starting position for the main event by finishing second to Brown in the dash. Brown bolted early on in the FVP/Casey’s General Store No. 21, pacing the early rounds as he vied for a weekend sweep after topping Friday’s card at Cocopah Speedway. But as traffic came into play, Abreu and Gravel closed in to challenge. In tight formation at the midway point, Abreu slid to the front on the 16th lap with Gravel following in his tracks. Abreu battled through some contentious traffic and then denied a last lap bid from Gravel to secure the win. “Once I cleared some lapped cars, I felt pretty confident that I just had to make clean laps,” Abreu said. 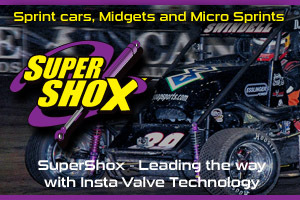 Gravel settled for runner-up honors at Arizona Speedway for the second year in a row. Brad Sweet crossed the stripe fourth with Jason Sides earning his second top-five finish of the weekend in fifth. Heat Winners (starting position in parentheses): David Gravel (1), Joey Saldana (1), Jason Sides (1). Heat Moments: A caution-free evening began with all three heats won from the pole with Jason Sides’ slide up the track in the opening pair of corners of the third heat to deny Brian Brown’s charge around the high side the most dramatic lead battle moment; Rico Abreu shuffled front row outside starter and defending race winner Shane Stewart back to third in the opening pair of corners of the second heat to snare a Dash position. Heat Moments: An invert of six put Brown on the pole of the Dash and he capitalized by earning his second feature pole starting positon in as many nights while Abreu’s heat race move paid dividends with a runner-up Dash finish. “B” Main Winner (starting position in parentheses): Kraig Kinser (2). “B” Main Moments: Stevie Sussex paced the opening ten laps before Kraig Kinser slid into the lead on the white flag lap with Jacob Allen stealing the runner-up position on the final round. “A” Main Hard Charger: Kraig Kinser took momentum from the late “B” Main win to climb eight positions from 19th to 11th in the feature event. Qualifying : 1. 5-David Gravel 12.747, 2. 17-Joey Saldana 12.751, 3. 7s-Jason Sides 12.773, 4. 41-Jason Johnson 12.790, 5. 2-Shane Stewart 12.825, 6. 21-Brian Brown 12.827, 7. 49-Brad Sweet 12.852, 8. 24-Rico Abreu 12.940, 9. 93-Sheldon Haudenschild 12.971, 10. 41s-Dominic Scelzi 12.974, 11. 19-Brent Marks 12.977, 12. 15-Donny Schatz 12.977, 13. 4-Paul McMahan 12.994, 14. 1s-Logan Schuchart 13.041, 15. 18-Ian Madsen 13.064, 16. W20-Greg Wilson 13.099, 17. 2x-Parker Price-Miller 13.188, 18. 9-Daryn Pittman 13.215, 19. 82-Stevie Sussex 13.219, 20. 11k-Kraig Kinser 13.250, 21. 1a-Jacob Allen 13.267, 22. 90-Lance Norick 13.351, 23. 2a-Austin Pierce 13.354, 24. 5c-Billy Chester, 25. 22-Cori Andrews 13.781, 26. 13-Clyde Knipp 13.784. Heat #1 (8 Laps) – Top 6 Transfer to Feature: 1. 5-David Gravel (1), 2. 41-Jason Johnson (2), 3. 49-Brad Sweet (3), 4. 4-Paul McMahan (5), 5. 41s-Dominic Scelzi (4), 6. W20-Greg Wilson (6), 7. 82-Stevie Sussex (7), 8. 90-Lance Norick (8), 9. 22-Cori Andrews (9). Heat #2 (8 Laps) – Top 6 Transfer to Feature: 1. 17-Joey Saldana (1), 2. 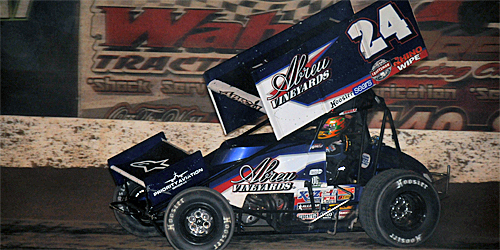 24-Rico Abreu (3), 3. 2-Shane Stewart (2), 4. 19-Brent Marks (4), 5. 1s-Logan Schuchart (5), 6. 2x-Parker Price-Miller (6), 7. 11k-Kraig Kinser (7), 8. 2a-Austin Pierce (8), 9. 13-Clyde Knipp (9). Heat #3 (8 Laps) – Top 6 Transfer to Feature: 1. 7s-Jason Sides (1), 2. 21-Brian Brown (2), 3. 15-Donny Schatz (4), 4. 18-Ian Madsen (5), 5. 93-Sheldon Haudenschild (3), 6. 9-Daryn Pittman (6), 7. 1a-Jacob Allen (7), 8. 5c-Billy Chester (8). Craftsman Club Dash (6 Laps): 1. 21-Brian Brown (1), 2. 24-Rico Abreu (2), 3. 41-Jason Johnson (3), 4. 17-Joey Saldana (5), 5. 7s-Jason Sides (4), 6. 5-David Gravel (6). Last Chance Showdown (12 Laps): Top 6 Transfer to Feature: 1. 11k-Kraig Kinser (2), 2. 1a-Jacob Allen (3), 3. 82-Stevie Sussex (1), 4. 2a-Austin Pierce (5), 5. 5c-Billy Chester (6), 6. 90-Lance Norick (4), 7. 13-Clyde Knipp (8), 8. 22-Cori Andrews (7). Feature (30 Laps): 1. 24-Rico Abreu (2) [$10,000]; 2. 5-David Gravel (6) [$5,500]; 3. 21-Brian Brown (1) [$3,200]; 4. 49-Brad Sweet (7) [$2,800]; 5. 7s-Jason Sides (5) [$2,500]; 6. 15-Donny Schatz (9) [$2,300]; 7. 41-Jason Johnson (3) [$2,200]; 8. 2-Shane Stewart (8) [$2,100]; 9. 17-Joey Saldana (4) [$2,050]; 10. 4-Paul McMahan (10) [$2,000]; 11. 11k-Kraig Kinser (19) [$1,500]; 12. 93-Sheldon Haudenschild (15) [$1,200]; 13. 18-Ian Madsen (12) [$1,100]; 14. 9-Daryn Pittman (18) [$1,050]; 15. 41s-Dominic Scelzi (13) [$1,000]; 16. W20-Greg Wilson (16) [$900]; 17. 1s-Logan Schuchart (14) [$800]; 18. 2x-Parker Price-Miller (17) [$800]; 19. 19-Brent Marks (11) [$800]; 20. 82-Stevie Sussex (21) [$800]; 21. 2a-Austin Pierce (22) [$800]; 22. 1a-Jacob Allen (20) [$800]; 23. 5c-Billy Chester (23) [$800]; 24. 90-Lance Norick (24) [$800]. Lap Leaders: Brian Brown 1-15, Rico Abreu 16-30.